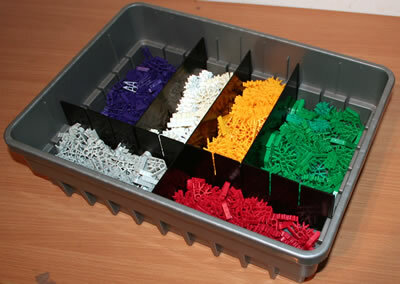 The K'NEX sets below are mainly designed for use in school and in other educational settings, although home users may also find them of interest. 1. The sets below can only be ordered online for shipment to the UK and Ireland. If you wish us to ship any of these sets to another country, please email us for a quotation. 2. Delivery will usually take up to 5 working days (UK) or 10 working days (Ireland). 3. 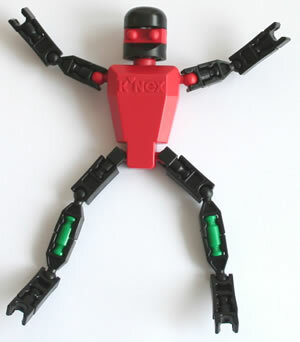 It is not possible to combine an order for the sets below with an order for the K'NEX sets or parts on any other page of this website. You will need to raise two separate orders. You may prefer instead to view the 9 best education sets that are available for immediate shipment from our own warehouse. 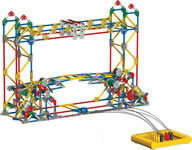 The K'NEX Levers and Pulleys building set allows 1-2 children to build 3 models: a Balance, a Wheelbarrow and a Sailboat. A fascinating K'NEX set allowing 7 different geared models to be built - Fan, Car window, Blender, Phonograph, Eggbeater, Stationery bike and Chainsaw. When used at school or college, enables teachers help their students to understand the principles of gears. Supports 2-4 students working as a team. Includes 51-page teacher's guide on CDROM, which contains a wealth of information on gears and 5 comprehensive lesson plans. The set includes 500 parts plus a battery-powered motor for a single pupil (or team of 2-3 children) to build a working Roller Coaster, plus two additional models: a Ramp and a Half-Pipe. Each model can be built one at a time. A specialised K'NEX curriculum set that allows students to build DNA and mRNA molecules, and learn about phosphate groups, deoxyribose sugars, colour-coded hydrogen bonds, four codons and colour-coded nucleotides. Builds 7 different models from instructions, one at a time, namely: Basic DNA molecule, Basic double helix, Flexible double helix, DNA replication, Daughter double helix, Large DNA molecule/double helix, DNA transcription. Supports 2-4 students working as a team. Suitable KS4, FE, HE. Includes a 44-page Guide which contains a wealth of information for teachers and educators on DNA, Replication & Transcription, and 7 comprehensive lesson plans. A large Kid K'NEX set that includes wheels for making a range of vehicles, including cars and diggers. Good for home, nursery, school and family learning. Builds 9 models from full colour building cards. Includes 20 truck wheels and 16 small wheels. When used in school, supports 8-10 children. Teachers guide includes characteristics of each bridge type, investigative activities and building challenges. Supports 6-8 students working in teams of 3-4. 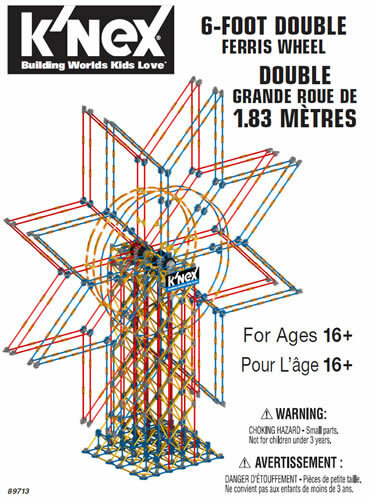 Fascinating KNEX set that can build 13 different amusement park rides, including a large Roller Coaster. Sufficient pieces to build two fairground ride models at the same time, or one Roller Coaster plus one fairground ride. 90-page teacher's guide. Includes 2 blue battery motors. Supports 8 students. Dynamic STEM set challenges students to build and control K'NEX models using the K'NEX Computer Control interface. Students write programs to control on-screen K'NEX models using the software included, then download them into the interface's memory and use them to operate student built K'NEX models. Build 5 K'NEX models, one at a time. Models are fully functioning replicas of real-world machines and include a Sliding Door, Elevator, Opening Bridge, Oscillating Fan and Super Spinner Ride. Compatible with interactive whiteboards. PC Compatible. Set contains K'NEX Computer Control Interface and software, 2 motors, 3 LEDs, 1 Buzzer, 2 Push Button Switches, 2 Reed Switch, 4 Magnets, building instructions, student challenges and teacher's guide.